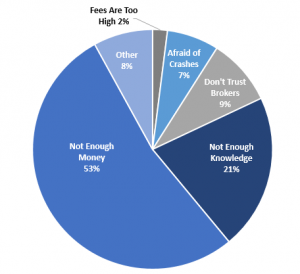 Top reasons why people have investing fears and how auto-investing with iBillionaire can help you. Recently, Bankrate.com released a pretty shocking survey. The survey showed that over 50% of Americans are not investing in the stock market. And yes, that includes mutual funds and stock based 401(k)s and IRAs! Part of the reason this number is so high is because of a variety of different investing fears that people have — but don’t worry, iBillionaire is here to help! If the phrase ‘investing in the stock market’ brings up beads of sweat on your brow, iBillionaire is here to smash through some of the common roadblocks and to show you how easy it is for anyone to get started and begin investing in the market. If you think you don’t have enough money to even start investing, think again. With any of the Saving Plans on offer at iBillionaire, you can invest as little as $5 per month! Even if you only have $20, you can start investing in one of these plans and get your foot in the door. This one is easy — who better to learn from other than some of the brightest minds in the country? iBillionaire tracks some of the wealthiest billionaires in the US and allows you to effortlessly match your investing habits to theirs. You won’t need to lift a single page of any investing book. We take our security seriously. Every iBillionaire account is insured up to $500,000 by the Securities Investor Protection Corporation (SIPC) and your sensitive personal information is fully encrypted and securely stored. In terms of your investments, you call the shots — the iBillionaire platform allows you to fully control your investment choices and allows you to place your money where you want, when you want. iBillionaire has a really simple pricing structure and we don’t charge for re-balancing or trading. Our mission is to encourage as many people to save as possible, whether you are just beginning or are a seasoned investor, so therefore we like to keep things straightforward. So there you have it! What’s stopping you from opening an iBillionaire auto-investing account today? Head of Digital Marketing at iBillionaire. Experienced in PPC, SEO, and SEM. Has previously worked with a boutique agency focusing in the financial and insurance sector. Graduated from Tufts University. I’d perpetually want to be update on new blog posts on this site, bookmarked! . That’s great! And good news: You can sign up to receive notifications when we write new blog posts. Just go to the bottom of the homepage and enter your email address where it says, Subscribe to our blog.